November 7, 2017 – A giant collision of several galaxy clusters, each containing hundreds of galaxies, has produced this spectacular panorama of shocks and energy. The collisions generated shock waves that set off a celestial fireworks display of bright radio emission, seen as red and orange. In the center of the image, the purple indicates X-rays caused by extreme heating. The region is collectively known as Abell 2744, some 4 billion light-years from Earth. The radio portion of the image comes from new observations made with the National Science Foundation’s Karl G. Jansky Very Large Array (VLA), and is combined with earlier data from NASA’s Chandra X-ray observatory. Both are overlaid on an image at visible-light wavelengths made with data from the Subaru telescope and the Very Large Telescope (VLT). The new VLA observations revealed previously undetected regions where shocks accelerated subatomic particles, causing radio emission. 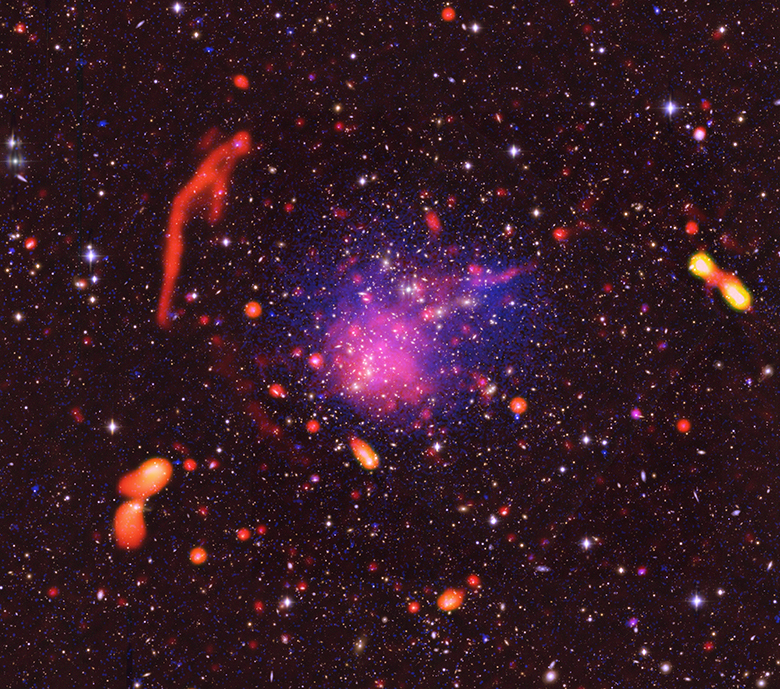 Astronomers are studying the combined image in an attempt to decipher the sequence of galaxy-cluster collisions. Currently, they said, evidence indicates a North-South (top-bottom in the image) collision of subclusters and an East-West (left-right in the image) collision. There is a possible third collision, and the astronomers continue to analyze their data to uncover more details about the region’s complex history of collisions and their aftermath.